Despite the post-Kirchner government’s many faults, one thing that it’s doing right is retaining the Argentinian-Chinese Strategic Partnership, which holds the best hope for Beijing to balance Trump’s “Fortress America” plans in the hemisphere. This week’s G20 Summit has drawn global attention to the host country of Argentina, a South American nation that’s recently experienced a US-backed Hybrid War regime change through electoral means. Washington supported the opposition’s infowar against former President Cristina Kirchner there and ended up successfully reshaping popular perceptions to the point where right-wing neoliberal candidate Mauricio Macri narrowly defeated her chosen successor in the 2015 polls. He then wasted no time in reversing her “Pink Tide” legacy, but the one element of it that he importantly retained was his country’s strategic partnership with China, which is presently Beijing’s best hope for balancing Trump’s “Fortress America” plans in the hemisphere following Bolsonaro’s US-backed rise in neighboring Brazil. In a nutshell, the US wants to reclaim its previously undisputed hegemonic position in the Western Hemisphere that was severely challenged during the “Pink Tide” of the mid-2000s, to which end it’s carried out a series of creative regime change operations in the region via military coups, electoral coups, and ‘constitutional coups’ to remove the multipolar gains from that time. This grand strategic campaign has yet to be successfully completed and is presently being pushed back against by the People’s Republic in an unexpected way following El Salvador’s surprising geopolitical pivot towards China a few months ago, which greatly advanced Beijing’s designs in the region and opened up a fresh opportunity to inject multipolarity into this increasingly unipolar space. Nevertheless, for as strategically positioned as Central America is, it isn’t capable on its own of serving as the springboard that China needs for reversing the US’ recent gains in the hemisphere, but could instead function as a complementary part of a larger holistic strategy there that sees much more economically influential countries taking the lead in this respect. Mexico immediately comes to mind as the prime candidate if AMLO sees the wisdom in “balancing” between the US and China, such as if he seeks Chinese support for building his promised “Tehuantepec Corridor” and joining his Foreign Minister’s suggestion for a joint Mexican-American “Marshall Plan” in Central America aimed at stemming illegal migration from there. Basically, Kirchner locked her country into a strategic partnership with China by agreeing to prohibitively costly “cross-cancellation clauses” that made it impossible for Macri to pull out of Argentina’s Silk Road deals with it. In addition, Reuters notes that “China is the main importer of Argentine soybeans, the South American country’s biggest cash crop”, so the country’s influential agricultural lobby also stood to lose if Buenos Aires “recalibrated” its relations with Beijing to such an extent that its counterpart felt compelled to respond by boycotting its purchase of their soybeans. Naturally, Macri had no practical choice but to retain the Argentinian-Chinese Strategic Partnership, which is expanding to this day. Interestingly enough, the Argentine model might be applied to Bolsonaro’s Brazil in the future too as China seeks to convince him to “moderate” the anti-Chinese rhetoric that he spouted on the campaign trail after realizing that his country might stand to lose too much if it worsens relations with Beijing at Washington’s behest. There are certainly differences between Argentina and Brazil’s relations with China, but the two South American countries have historically been rivals and Beijing could potentially seek to play Buenos Aires off against Brasilia in the future by refocusing on the first-mentioned if the second makes it too difficult for its companies to continue doing business there. Furthermore, Argentina could play an important role in influencing the outcome of Mercosur’s free trade negotiations with other blocs, possibly with Beijing’s blessing. For example, Brazil just signed a free trade agreement with Chile, which outgoing President Temer celebrated as “uniting the Mercosur and Pacific Alliance”. This suggests that the continent’s two main economic camps could come together to form a South American-wide free trade area in the future, one which might jointly advance Mercosur’s free trade talks with the EU and possibly even the US. None of this can happen, however, without Chinese-friendly Argentina greenlighting the process, and Beijing might use Buenos Aires as its “backdoor” into this larger trade network. China, after all, is investing considerable human resources into ensuring that its influence in the Western Hemisphere isn’t ephemeral. President Xi was quoted in a Spanish newspaper on Tuesday as proudly proclaiming that “This year, Spanish is officially included in China’s high school curriculum”, proving just how much the People’s Republic values this language that it’s giving hundreds of millions of schoolchildren the opportunity to learn it for boosting their future Silk Road career prospects. Argentina is undoubtedly expected to form the fulcrum of China’s South American strategy in this respect by virtue of the two nations’ strategic partnership, symbolized most significantly by their plans to clinch a nuclear energy deal this weekend. 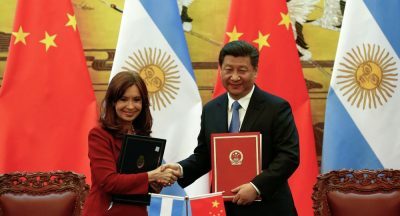 If China succeeds in reaching such a high-level agreement with Argentina, then it would intimately tie both of their countries together in a deeply trusting long-term relationship that could enable Beijing to positively influence Buenos Aires’ decisions on some key issues, such as the previously discussed free trade negotiations. Furthermore, this deal would position Argentina as China’s main strategic partner in Latin America, thereby seriously complicating Trump’s “Fortress America” plans by extent and possibly even leading to Bolsonaro “moderating” his promised anti-Chinese positions once he takes office at the beginning of next year. In addition, the demonstration effect of this partnership could also influence other countries such as Mexico to follow Argentina’s lead in using China to “balance” the US. The “Pink Tide” might have given way to a revival of the unipolar moment in Latin America, but just like its global predecessor, this moment might only be fleeting and already on the decline if China is able to nimbly leverage its strategic partnership with Argentina to offset Trump’s “Fortress America” plans. Should that happen, then the “Pink Tide” might transform into a “Red Dawn”, especially if China coordinates its moves with AMLO’s leftist Mexico and facilitates the North American country’s expansion of influence into comparatively Chinese-friendly Central America by signing on to its so-called “Marshall Plan” for the region. A lot can still happen to sabotage this grand strategy, but as it stands, Trump shouldn’t underestimate China’s challenge to his hemispheric plans.